King County monitors the ecological health of the Cedar River basin in a variety of ways, including collecting and analyzing water and benthic invertebrate samples. Sampling at the upstream station A438, located at the bridge on East Jones Road at 196th Ave South East, began in 1972. It was discontinued in 2008 after budget cutbacks forced King County to reduce the breadth of its water quality monitoring program. Sampling was resumed in 2014. Sampling at station 0438, located upstream at river mile (RM) 1.46 at the bridge on Bronson Way, began in 1976. It was discontinued in 1989 and resumed again in 2009. An additional water quality site, X438, was added in 1996 just above the mouth of the river where it enters Lake Washington. Sampling at X438 was discontinued in 2008. Benthic invertebrates have been sampled at various locations in tributaries to the lower Cedar River since 1995. From time to time, additional studies have been conducted on Cedar River. Click here for more information about Special Studies. The Cedar River basin can be divided into two reaches: the Upper Cedar River from the Cascade Crest to the Landsburg Diversion Dam; and the Lower Cedar River from the Landsburg Dam to the mouth at the City of Renton, Washington. Total land use in the basin is mostly forest, with some development and little agriculture. Of forestland, a majority is evergreen forest. Developed land is mostly a mix of open space and low intensity, and agriculture is entirely pasture/hay. Other land use consists of barren land, grassland, and open water. See Table 1 below for more details on land use. The Upper Cedar River encompasses roughly 79,951 acres and runs 25 miles from Meadow Mountain near Cascade Crest (elevation 5,414 feet) to the Diversion Dam (elevation 543 feet). The City of Seattle, Washington owns 79,452 acres of this part of the basin that is upstream of where the City of Seattle diverts a drinking water supply from the Landsburg Dam. The remaining 499 acres is owned by other parties (Kerwin, 2002). There are several major tributaries that drain into the Upper Cedar River, including Upper Rock Creek (2,917 acres) at RM 3.9, Williams Creek (1, 564 acres) at RM 29.6, Steele Creek (788 acres) at RM 31.7, and Upper Taylor Creek (10,950 acres at RM 29.5). Taylor Creek has the largest drainage area and provides approximately 15% of the total Upper Cedar River flows (Hart Crowser, 1983; Kerwin, 2002). The Lower Cedar River drains 42,240 acres and runs approximately 21.7 miles from below the Landsburg Dam to Lake Washington. The Lower Cedar River basin is primarily (90%) within the jurisdictional boundary of King County. The remaining jurisdictional area is within the cities of Renton (7.8%), Maple Valley (2.1%) and Kent (0.8%). The aquatic habitat of the Lower Cedar River basin has been altered dramatically since the 1800s by human activity. This includes activity such as water supply dams, agriculture, coal mining, railroad construction, and development. The City of Seattle built the Landsburg Diversion Dam in 1901 to divert water for municipal use and the Masonry Dam further upstream in 1914 for water supply, flood control and hydroelectric power generation (City of Seattle, 2000a). Prior to this there had been many alterations to the mainstem due to railroad construction and operation. Water withdrawal and flow regulation are primary causes for the reduction in the average mainstem channel width from 250 feet in 1865 to 170 feet by 1936. Further flood control structures constricted the average channel width an additional 35% compared to the 1936 condition to 110 feet. The Cedar River Current and Future Conditions Report (King County, 1993) describes in depth historic flood control and management efforts in the Cedar River. Chinook salmon, coho salmon, sockeye salmon, kokanee, winter steelhead, bull trout, and coastal cutthroat are known species to inhabit the Cedar River system (Kerwin, 2002). Volunteers with the Salmon Watcher Program made observations at various locations within the Cedar River basin from 1997 to 2015. There are several reports that include comprehensive information about the fisheries and ecosystems of the Cedar River. 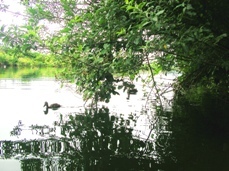 The City of Seattle's Cedar River Habitat Conservation Plan includes extensive information about the Cedar River ecosystem (City of Seattle, 2000a). In addition, the 2005 Proposed WRIA 8 Chinook Salmon Conservation Plan is a science-based plan developed through a collaboration of citizens, scientists, community, business, environmental groups, local elected officials, and public agency staff. The plan recommends actions to restore and protect salmon habitat, and provides an approach to implement these actions over the next ten years. Additional fisheries resource information can be found at the WRIA 8 salmon webpage. State water quality standards were revised in 2003. The Cedar River is now categorized as “Core Summer Salmonid Habitat” for aquatic life use. As part of the updated water quality standards, these lower portions of the river have been assigned an additional “Supplemental Spawning and Incubation Protection” temperature criteria of 13 ºC to be applied from September 15th to June 15th. For recreational use the river is designated “Extraordinary Contact” from the mouth to RM 4.1, and “Extraordinary Primary Contact from RM 4.1 to the headwaters. The river is on the Washington State Department of Ecology’s (Ecology) 303(d) list for violation of water temperature, DO, and pH standards (Category 5). These violations occurred in the Lower Cedar River watershed near its outlet into Lake Washington. A 36-year (1972 – 2007) trend analysis was conducted with water quality data collected from the upstream station (A438). A 12-year (1996 - 2007) trend analysis was conducted with X438 water quality data. As with most streams in Water Resource Inventory Area (WRIA) 8, there has been a significant increase in water temperatures at A438 over the 36-year time period. Conductivity increased at both sites. At X438 total phosphorus concentrations increased and DO concentrations decreased. There have been some improvements in water quality as evidenced by the decrease in total suspended solids (A438), turbidity (A438), FC (A438), ammonia (both sites), and ortho-phosphorus (A438). A Water Quality Index (WQI) rating system was developed by Ecology that evaluates several water quality parameters and gives a single rating of “high,” “moderate,” or “low” water quality concern. To view WQI scores for the Cedar River sites, please visit the Water Quality Index webpage. King County does not currently operate any gages on the Cedar River. Stream sediment data is not currently collected from the Cedar River. For more information about benthic macroinvertebrates and King County’s Benthic Macroinvertebrate Program, please visit the King County Stream Bug Monitoring webpage. To see the benthic macroinvertebrate data for tributaries to the Cedar River, please visit the Puget Sound Stream Benthos webpage. The King County River and Floodplain Management Section conducted a study in 2010 about recreation on the Cedar River. Data was collected between May and September of 2010 using riverside observations, interviews, and an infrared counter. The purpose was to understand the primary boating and floating areas along the Cedar River and characterize the floating experience for recreational users. The City of Renton obtained a grant from the Puget Sound Partnership’s Puget Sound Acquisition and Restoration Fund (PSAR) program to study potential Chinook salmon habitat restoration sites in the lower Cedar River and its floodplain to develop conceptual designs for several sites that are deemed the best opportunities. As part of the City of Seattle Habitat Conservation Plan, a fish ladder was constructed at the Landsburg Diversion Dam to provide passage of Pacific salmon Oncorhynchus spp. to ~33 km of available habitat. In September 2003, adult salmon passed above Landsburg Dam for the first time since 1900. This long-term monitoring study found that recolonization of the Cedar River above Landsburg Dam by coho and Chinook has led to a rapid increase in total salmonid density (including both trout and salmon). In WRIA 8, citizens, scientists, businesses, environmentalists and governments have worked cooperatively on protection and restoration projects and have developed a science-based plan to conserve salmon for future generations. The Lower Cedar River Basin and Nonpoint Pollution Action Plan describes current conditions in the basin and proposes solutions to the problems of flooding, property damage and declining salmon and steelhead runs. It also recommends preventive measures to protect and maintain water quality, groundwater supplies and habitat as the basin planning area continues to develop. Preventing problems in the watershed is much more cost-effective in the long term than trying to correct problems once they occur. The plan was adopted by the Metropolitan King County Council in July, 1997.